Welcome to the St. Francis School kindergarten program! We are pleased that you have considered St. Francis School for your child. Our program continues to nurture the Catholic values instilled at home. Parents and teachers work cooperatively to build a partnership between home and school. Our kindergarten students will increase their knowledge of the world around them through a balance of academic and social learning. We will help each child grow and prepare for a successful school experience. Children will learn both formally and informally through a wide range of activities. The religious education program for kindergarten children is designed to support parents in educating their children about the Catholic faith. The children are taught that they are unique and that God has given each of them special gifts and talents. 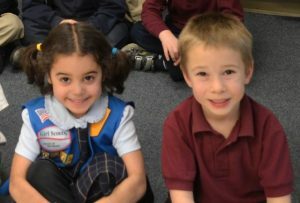 They learn to follow the way of Jesus by being kind to others and by treating their classmates and adults with respect. They learn spontaneous prayer as well as formal prayers that are said every day in class. Kindergarten students also participate in the school-wide Eucharistic Adoration and prayer services. In addition to the formal God Loves Us program, the children learn about the lives of saints (St. Francis, St. Patrick, patron saints, etc. ), Mary, the Mother of God and simple Bible stories. There are special projects during Advent and Lent that encourage the students to do good deeds for others. The children also learn about the importance of stewardship. Faith development is a process that is started at home and reinforced at school by encouraging students to help others, take turns, listen and care for other people. Teachers provide a warm, loving environment where everyone is accepted as a special child of God. Students will attend Mass with the entire school. Learning centers are designated areas in the classroom where the teacher selects the materials and designs open-ended activities for the children. The students choose various hands-on activities and work individually or in small groups. Focus areas are literacy, math, science, social studies and higher-level problem solving. Kindergarten has adopted a program titled: CR Success Early Literacy (formerly known as the F.A.S.T. Early Literacy Program). It is a research-based program that provides direct instruction in the five essential components of reading: phonemic awareness, phonics, fluency, comprehension and vocabulary. It also has specific instruction in spelling and handwriting. Its unique characteristic is its holistic integration of phonological skills, systematic phonics and language-based instruction. It includes a comprehensive scope and sequence, summative and formative assessments and the use of active, multisensory learning. The CR Success Readers are an integral part of the program. These decodable books are sequentially written and are leveled by reading complexity (Lexile levels). Phonemic awareness is reinforced through the use of Michael Heggerty and constant sequential modeling. Reading is taught with a formal phonics and writing program that gives each child a variety of oral language and literature experiences. The children are grouped according to specific skills needed, interests and abilities. While the teacher works with guided reading groups, the rest of the class visits the centers including the reading and writing centers to reinforce the lesson they had with the teacher. Individual books are provided to each student. The teacher guides students through their individual books. This helps lay the foundations for independent reading. The children learn the proper position to use while writing. Not only do they learn how to sit, they also learn the way to position the paper and the proper way to hold the pencil. They begin by practicing vertical, horizontal and slanted lines, and then practice making backward and forward circles. The children learn to write both uppercase and lowercase letters of the alphabet. Later in the year, students begin to write words and sentences. The kindergarten children are taught to write their first and last names, using uppercase and lowercase letters. They also learn the proper way to write numerals from zero to twenty. Handwriting is aligned with the CR Success Early Literacy program. Kindergarten children learn that letters were developed to spell sounds. They learn how words and sentences are formed and how to write left to right and top to bottom. The students learn to use uppercase letters to begin a sentence and when using a proper noun. They learn when to use a period, question mark and exclamation point. The teacher provides interactive writing daily with modeling. Our formal text for math is Math Expressions by Houghton Mifflin. The scope and sequence from the book is used along with other resource materials aligned with core concepts, hands on activities, explanation and student application. A math journal is also used on a daily basis to reinforce math concepts in a creative way. Kindergarten uses math instruction that exploits the critical stages of cognitive growth in children. The Macmillan/McGraw Hill curriculum is used in kindergarten. It is divided into three sections: Life Science, Earth and Space Science and Physical Science. Life science is the study of living and non-living things, as well as plants and animals. Our study of physical science covers the topics of matter, sound, heat, light and movement. While studying earth science, the children learn about land, water, earth, sky, weather, the four seasons and the solar system. Conservation, recycling and responsibility for caring for our earth are strongly integrated throughout the year. Students do simple science experiments throughout the year that provide hands-on experience within each of the disciplines. Natural curiosity is encouraged and the children are taught to respect all life. Students visit the science lab often during the school year. The scientific process is taught and students learn the value of the process. Kindergarten students will use part one of the Technology Education series by Structured Learning. All students use the computer lab on a weekly basis. They learn to turn the computer on and off, the parts of the computer, and various mouse skills such as click, press, and drag. Later in the year, Kindergarten children are introduced to very basic keyboard skills as they learn how to type their name, simple words, and sentences that describe pictures they have created. Children who come to kindergarten may already have some space, time, and casual knowledge about their own world. During their school experience, they will expand these understandings, moving outward to learn about other people, place, and times. Forging links with people from the past, both ordinary and extraordinary is part of this exploratory process. To meet the standards of the kindergarten curriculum, the text Our World, Now and Long Ago, by Harcourt is used. Units studied are: being a good citizen, My Country, Workers, Where We Live, Time Goes By, and Stories of the Past. Students become acquainted with the Spanish language through fun, entertaining activities with puppets, music, picture cards, stories, skits, projects and vocabulary games. Learning about countries and cultures of Latin America and Spain are also part of the Spanish program. Children participate weekly in gym class to develop their locomotor and non-locomotor skills. Physical fitness is improved through activities and playing games. Cooperation and sportsmanship are encouraged and children learn to work cooperatively as a team. In weekly Art classes, the developmental approach is used as children learn about colors, shapes and various kinds of lines. They develop skills such as cutting, pasting and learning to mix primary colors to make secondary colors. In addition to various other mediums, they learn to work with clay. The children are introduced to various artists and their specific styles. Several of their works are displayed in the school art show in May. Kindergarten also attends weekly music classes where they actively learn music concepts and aesthetics through creative movement, listening activities, singing, playing simple instruments and performing rhythm activities. Beginning notation and composition is experienced through the Orff and Kodaly methods. The kindergarten children also perform in our annual Christmas program. Once a week the children go to the library. They learn how to check out books as well as the proper way to take care of books. The children learn about authors, illustrators and publishing companies. The enrichment program is supplemented with a field trip to a local theater production in the spring. This also supports a specific author study from the language arts program.